PAUL HARDYMAN is looking for clarity after being offered a new role at Pompey. Hardyman was yesterday told he is no longer wanted in the club’s first-team set-up after meeting with new boss Paul Cook. The 51-year-old is part of a backroom shake-up at Fratton Park, with Gary Waddock leaving the club. Head of recruitment, Andy Melville, has also departed with lead strength and conditioning coach, Louis Langdown. Hardyman met with Cook at the club’s Roko training base in Hilsea after returning from holiday on Saturday. There is suggestion of another position for the club stalwart, who has served the club for nearly 25 years as a player and coach. The same was mooted for both Andy Awford and Alan McLoughlin, however, before their departures. Hardyman would be keen to stay on but wants precise information on what lies ahead for him. When contacted over his exit, Hardyman said: ‘I would like some clarity on the role. ‘I’m not sure what is going to happen. ‘Until I know what it’s about I’m going to be unsure of my future. 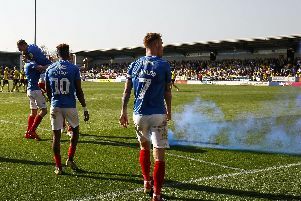 Hardyman was appointed first-team coach at Pompey last summer, after helping guide the team to League Two safety as part of Awford’s staff. Waddock arrived in December when McLoughlin left Fratton Park, while Melville was recruited in February. Cook is set to appoint his assistant manager from Chesterfield, Leam Richardson, and add Coventry’s under-21 manager, Ian Foster, to his staff.